Crop growers thinking about getting a head start on planting this year should remember that their crop insurance policy has an early planting restriction. This initial planting date is the earliest date they may plant an insured crop and still qualify for a replanting payment if the crop suffers an early loss. 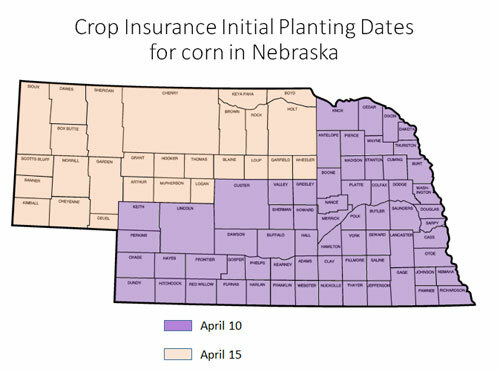 For corn in the eastern two-thirds of Nebraska, the initial planting date for crop insurance is April 10. For northwest Nebraska, the initial planting date for corn is April 15. See the map from USDA's Risk Management Agency for county-by-county dates. RMA is concerned about cropping practices that may otherwise increase the chance of a crop loss and hence an insurance indemnity. Based on agronomic experience, these initial planting dates represent the earliest planting dates which would not pose an unusually high risk of early crop loss, in RMA's judgment. For more information, view RMA's initial planting dates for all spring-planted crops in Nebraska, including corn, dry beans, grain sorghum, popcorn, soybeans, sugar beets, and sunflowers. If you have further questions, check with your local crop insurance agent or the RMA Regional Office in Topeka, Kan., which oversees crop insurance programs in Nebraska.